Maria Theresa Costa Ramos de Oliveira3, Heloisa Nardi Koerner3. vestibulocochlear nerve, tinnitus, hearing loss, audiometry, MRI (magnetic resonance imaging). Introduction: The vascular compression by redundant vessels under the VIII cranial nerves has been studied since the 80's, and many authors proposed correlations between the compression and the otoneurological findings (vertigo, tinnitus, hypoacusis, audiometry and electrophysiological findings). Objective: Analyze and correlate the different signs and otoneurological symptoms, the audiological findings and its incidence over individuals with Vascular Loop (VL) diagnosis of VIII cranial nerves by magnetic resonance imaging (MRI). Method: Retrospective study through the analysis of medical records of 47 patients attended in the otoneurology clinic of Clinical Hospital of UFPR. All the patients have MRI exams with compatible pictures of VL of the VIII cranial nerves. Results: The tinnitus was the most frequent symptom, in 83% of the patients, followed by hypoacusis (60%) and vertigo (36%). The audiometry presented alterations in 89%, the brainstem evoked auditory potential in 33% and the vecto-electronystagmography in 17% of the patients. Was not found statistically significant relation between the buzz or hypoacusis, and the presence of VL in MRI. Only 36% of patients had complaints of vertigo, the main symptom described in theory of vascular compression of the VIII pair of nerve. As in the audiometry and in brainstem evoked auditory potential was not found a statistically significant relation between the exam and the presence of the VL in the RMI. Conclusion: The results show independence between the findings of the RMI, clinical picture and audiological results (p>0,05) suggesting that there are no exclusive and direct relation between the diagnosis of vascular loop in the MRI and the clinical picture matching. Vascular loop causing compression of the 5th cranial nerve resulting in trigeminal neuralgia was firstly suggested by DANDY in 1934 (1), and later, by GARDNER and MIKLOS (2) in 1959. This concept was then extensively expanded to try to explain disorders of various cranial nerves. These presentations are known as compressive syndromes, which include hemifacial spasms, glossopharyngeal neuralgia, geniculate neuralgia, and, more recently, a syndrome of the compression of the vestibule-cochlear nerve. Though MCKENZIE (3) suggested in 1936 that the Ménière Disease might be caused by an abnormal relation of the anterior inferior cerebellar artery (AICA) with the 8th cranial nerve, this concept was not reintroduced until 1975, when JANETTA (4) proposed that the redundant arterial loops at the cerebellar angle point (CAP) might interfere with the eight cranial pair resulting in symptoms of grave vertigo, tinnitus and auditory sensory neural loss. All pathophysiological theories are based on a common theme: a redundant vessel adhering to a cranial nerve causing chronic ectopic excitation. This results in a reorganization of the nervous nucleus causing nervous hyperfunction. It was suggested that this pathological procedure was restricted to the entrance area of the cranial nerve root, that being the junction area between central and peripheral myelin, where defects might occur. LANG showed that the central segment of the 8th cranial pair has a length of 10mm (6 to 15 mm) and an intracisternal length of 15mm (8,5 to 22mm). He found the transition area of the eight cranial nerve varying from the brainstem to the bottom of the Inner Auditory Canal (IAC). The known histology would be consistent with the occurrence of a syndrome of neurovascular compression of the eight cranial nerve, in any point of the trajectory, since the brainstem to the IAC. The existence of Vascular Compression Syndromes (VCS), and especially here with the compression of the VIII pair, was initially inferred by analogy to the hemifacial spasm syndrome, in which is well accepted that the cause is an aberrant vessel compressing the nerve. JANNETTA and MOLLER (5), from Pittsburgh, EUA, were the pioneers in the diagnosis and treatment of this disease. However, in other vascular compression syndromes proposed by the same authors (trigeminal neuralgia, glossopharyngeal neuralgia, etc.) they were not related and accepted as consequence of the vascular compression. The same authors, in 1984, described a VCS related to the 8th pair, called disabling positional vertigo, characterized by a history of: vertigo, usually in short term crisis (2-3min); hypoacusis, slight to moderate degree, typically with a notch in medium frequencies in audiometry and a latency between the waves I-III increased in the auditory evoked potential of brainstem (AEPB). The designation "positional vertigo" seems inappropriate, since the following authors did not emphasize this finding, as was the case in our study, as we'll see in the discussion. JANETTA e cols. proposed as treatment the placement of absorbent paper between vessel and nerve. Though the goal was to separate the effect of the vessel over the nerve, other authors (6, 7) questioned if this procedure would simply damage the structure of the VIII pair, or was totally unjustified. Others (8) suggested the complete section of the nerve as a treatment. There are also proposals of clinical treatment with carbamazepine, with good results. Thus, despite countless articles published about this condition, the mere existence of VCS is still questioned. VCS's symptoms are unspecific and can easily be found in other conditions such as Ménière Disease, migraine or just innate movement intolerance. There is not yet a specific test that is convincing. AEPB findings proposed by MOLLER (9) as characteristic of VCS would not be considered by many authors, such as SCHWABER and HALL (6, 7). Still, according to PARNES (10), no findings of computerized axial tomography (CAT) or magnetic resonance related to blood vessels would be diagnostic, since the vessels crossing the VII pair are found in less than 1/3 of the asymptomatic individuals. The variability of vascular anatomy of the CAP and the inner auditory canal (IAC) in normal people contributed to the controversy around the concept of vascular compression syndromes. Both post-mortem and radiologic studies investigated the place of the vascular loop formed by AICA in CAP (12, 13, 14). The results showed considerable discrepancies, though all studies indicate that vascular loops would enter on IAC in a minority of patients. 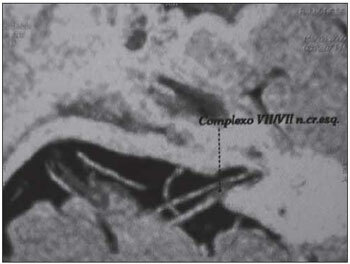 In essence, VCS of the VIII pair is a syndrome of vestibular symptoms (quick vertigo, combined with intolerance to moviment) and audiological symptoms that respond to treatment with medications for neuralgia (carbamazepine) and where other similar causes (Ménière, migraine) had been removed. Logically, none of the symptoms of this syndrome is excluded from a vascular origin, but their specific characteristics (intense and short term symptoms, that respond to medication for neuralgia) demonstrate an electrical problem, because any alteration that irritates the vestibular nerve will cause similar symptoms, as was already demonstrated in literature by MOON and HAIN (11). Thus, a more reasonable denomination for this syndrom is Vestibular Paroxysmia (VP). There are evidences that the vascular compression of the VIII is the most probable cause of vestibular paroxysmia (5, 12), with hyperactivity and progressive functional loss. It may be diagnosed by the occurrence of short episodes of rotatory dizziness (vertigo), precipitated or modulated by the change of position of the head, and can be associated to hypoacusis and/or tinnitus (13). On VP diagnosis, it is important to differentiate it from other syndromes that also cause episodic short term vertigo, such as VPPB, Méière's disease and vestibular neuritis. The vertigo of VP is triggered by head movements and is not fatigable, as in patiants with VPPB, and its symptoms are not relieved with the use of vestibular suppressors (5). In VP patients don't have fluctuating hearing loss, characteristic of Ménière's disease. Both computerized axial tomography (CAT) and magnetic resonance (MR) with vascular loop findings still haven't proved to be specific as diagnostic aid, but new types of MR, such as FT-FISS may be more specific. Recently, MCDERMOTT et al. (14), in extensive study, proposed that the loops that extend within the IAC are more significant as a source of unilateral auditory symptoms, like tinnitus, than those around the CAP. An abnormal AEPB on the side of the symptoms supports the diagnostic, but a normal exam does not exclude it. Thus, the definite diagnostic is achieved only after surgical exploration, with follow-up cure. Obviously, extreme care must be taken to indicate surgery, because a neurosurgical access to the brainstem is necessary, and should be considered in last case when all other clinical alternatives fail. The objective of this study is to analyze and correlate otoneurological signals and symptoms, audiological findings and their incidence in individuals with vascular loop (VL) of VII/VIII pair showed by Nuclear magnetic resonance imaging of cerebellar angle point. We analyzed 47 patients treated at the Otoneurology clinic of Hospital de Clínicas of Universidade Federal do Paraná, from June 2009 to May 2010. Degree I: Vascular loop completely outside of the Inner Auditory Canal. Degree II: Vascular loop insinuating as much as 50% in the Inner Auditory Canal. Degree III: Vascular loop insinuating more than 50% in the Inner Auditory Canal. We followed to the statistical treatment found appropriate according to the nature of the data collected, which consisted in making tables and graphics for the study of frequencies of the variables singly, as well as double entry tables for distribution and statistical analysis of the variable "vascular loop" versus "tinnitus", "hypoacusis", "audiometry" and "aepb". On the statistical analysis were used chi-square and Fisher tests, taking into account the expected frequencies, with significance level p<0,05. This study was approved by the ethics committee of HC/UFPR under the number 2248.142/2010-06. According to Table 1, the patients had average age of 56,1 years, ranging from 23 to 78 years of age, evenly distributed between both genders. Graphic 1 and Tables 2, 3, 4, 5, 6, 7, 8 and 9 present the frequencies of the otoneurological symptoms and altered exams from the patients. We found that, compared with the otoneurological symptoms, the tinnitus was the most frequent, being present in 39 (83%) of the patients, followed by hypoacusis, in 28 (59,6%) and vertigo, in 17 (36,2%) of the patients. Tinnitus was present in 39 (83%) of the patients, most commonly bilaterally. Eight patients (17%) did not complain of tinnitus. Hypoacusis appeared in 28 (59,6%) patients, with the remaining 19 (40,4%) without the complaint. Vertigo appeared in 17 (36,2%) of patients, with 30 (63,8%) without this complaint. The audiometry presented alterations in 89,4% of the patients, with bilateral losses as the most frequent. Five patients (10,6%) had normal audiometry. Thirty-one patients (66%), had normal AEBP, while 16 (33%) showed alterations in this exam. Of the 47 patients studied, 8 (17%) presented altered VENG. All the patients had alterations on the MR test, with diagnosis of vascular loop of VIII cranial pair. Twenty-five of them (53,2%) were bilateral, the remaining (46,8%) were unilateral. As to the type of vascular loop on the MR, 9 patients (19,1%) didn't have it classified, while 15 (31,9%) had type I, 17 (36,2%) type II and 16 (12,8%), type III. After that we crossed the data, analyzing the findings of MR versus the otoneurological symptoms and the complementary tests results, according to what is shown on Graphics 2, 3, 4 and 5 and in Tables 10, 11, 12, 13, 14, 15, 16, 17, 18 e 19. Of the patients with complaint of tinnitus on the right side, 4 (8,51%) had correspondent vascular loop on MR. To the left, 5 patients (10,6%) had tinnitus and loop at the same side, and of the 19 patients with bilateral complaint, 11 (23,4%) had MR imaging of bilateral vascular loop. Eight patients (17%) of the study did not complain of tinnitus and presented vascular loop on the MR. There is independence between the localization of the vascular loop and the side of the perceived tinnitus. There is also independence between the localization of the vascular loop and the mere presence of tinnitus, independently of the side perceived, as well as the typo of tinnitus perceived, pulsatile or not. Relating the complaint of hypoacusis to the side of the loop, five out of thirteen patients with vascular loop to the right side presented hypoacusis on the same side, only one patient out of nine with vascular loop to the left side reported hypoacusis also to the left and nine out of twenty-five with bilateral loop also reported bilateral hypoacusis. There is independence both between the localization of the vascular loop and the side of the perceived hypoacusis and between the presence of vascular loop and the symptomology of hypoacusis, independently of the side it was perceived on. Regarding the audiometric results, four of the thirteen patients with vascular loop to the right presented altered audiometry of the same side, two out of nine patients with vascular loop to the left had altered audiometry to the left and sixteen of the twenty-five with bilateral loop also presented bilaterally altered audiometry. There is independence between the localization of the vascular loop and the altered side of the audiometry. Analyzing the AEBP results, two of the thirteen patients with vascular loop to the right had altered AEBP on the same side, only one patient out of nine with vascular loop to the left had altered AEBP to the left and five of the twenty-five with bilateral loop also had bilaterally altered AEBP. There is independence between the localization of the vascular loop and the altered side of AEBP. Figure 1. Vascular Loop of VIII cranial pair. Graphic 1. 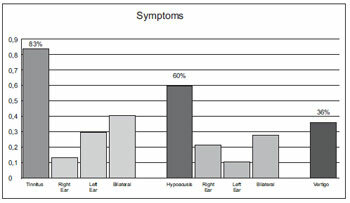 Distribution of the symptoms. Graphic 2. Distribution of tinnitus. Graphic 3. Distribution of hypoacusis. Graphic 4. Distribution of the audiometrical results. Graphic 5. Distribution of the AEBP results. We observed that in the symptoms presented by patients, regarding both tinnitus and hypoacusis, there is no statistically significance between the symptom and the presence of vascular loop on the MR, be it in relation to the side perceived, or even by the mere presence of the symptom. In tinnitus, even isolating only cases of pulsatile type, theoretically the one that would relate the most with the vascular loop, we noticed that the independence remains, and there is no direct relation between loop and tinnitus. This is also confirmed by the small number of patients of the study (7, or 14,8%) with complaint of pulsatile tinnitus. These findings corroborate those of MAKINS (15), who did not see any significant difference regarding the presence of vascular loop, between ears with signals and symptoms and healthy ears, suggesting that the presence of vascular loop on the MR is not pathologic, but an exam finding. 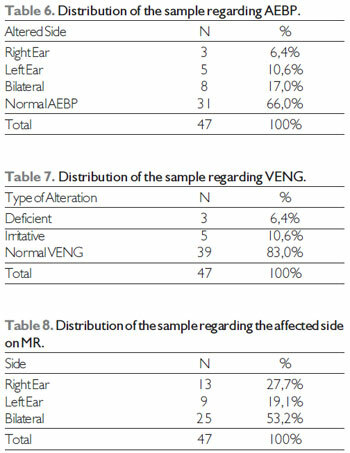 This independence remained in the analysis of audiologic exams (audiometry and AEBP), where the presence of vascular loop on the MR also did not present a statistically significance with the data from the audiologic exams. This reinforces the symptomatological findings, in this case without the subjectivity inherent to the symptoms. We also observed a relatively low incidence of altered AEBP, in 34% of the patients, since by the theory of vascular compression it was expected a more frequent alteration on the transmission of stimuli, represented by altered AEBP. We mentioned too the reduced incidence of vertigo as a symptom, (36,2% of the patients), since this was the main symptom described by early studies and the theory of vascular compression of the VIII pair. The presence of neurovascular conflict of the VII/VIII cranial pair on MR imaging did not justify by itself the otoneurological signals and symptoms and other audiovestibular alterations found on the individuals evaluated on this study. 1. Dandy WE. Concerning the cause of trigeminal neuralgia. Am J Surg. 1934, 24:447-55. 2. Gardner WJ, Miklos MV. Response of trigeminal neuralgia to decompression of sensory root: discussion of cause of trigeminal neuralgia. JAMA. 1959, 170:1773-6. 3. McKenzie KG. Intracranial division of the vestibular portion of the auditory nerve for Meniere's disease. Can Med Assoc J. 1936, 34(4):369-81. 4. Janetta PJ. Neurovascular cross-compression in patients with hyperactive dysfunction of the eighth cranial nerve. Surg Forum. 1975, 26:467-9. 5. Janetta PJ, Moller MB, Moller AR. Disabling positional vertigo. NEJM. 1984, 310:1700-1705. 6. Schwaber MK and Hall JW. Cochleovestibular nerve compression syndrome. I. Clinical features and audioves¬tibular findings. Laryngoscope. 1992, 102(9):1020-9. 7. Schwaber MK and Whetsell WO. Cochleovestibular nerve compression syndrome. II. Vestibular nerve histopathology and theory of pathophysiology. Laryngoscope. 1992, 102(9):1030-6. 8. McCabe BF, Harker LA. Vascular loop as a cause of vertigo. Ann ORL. 1983, 92:542-543. 9. Moller MB. Vascular compression of the eighth cranial nerve as a cause of vertigo. Keio J Med. 1991, 40(3):146-150. 10. Parnes LS, Shimotakahara SG, Pelz D, et al. Vascular relationships of the vestibulocochlear nerve on magnetic resonance imaging. Am J Otol. 1990, 11:278-281. 11. Moon I, Hain TC Delayed Quick Spins following Vestibular Nerve Section Respond to Anticonvulsant Medication. Otol Neurotol. 2005, 26:82-85. 12. Moller MB, Moller AR, Jannetta PJ, Sekhar L. Diagnosis and surgical treatment of disabling positional vertigo. J Neurosurg. 1986, 64:21-28. 13. Brandt T. Vertigo, its multisensory syndromes, 2nd Ed. London: Springer Verlag, 1999. 14. McDermott AL, Dutt SN, Irving RM, Pahor AL, Chavda SV. Anterior inferior cerebellar artery syndrome: fact or fiction. Clin Otolaryngol. 2003, 28(2):75-80. 15. Makins A, Nikolopoulos TP, Ludman C, O'Donoghue G. Is there a Correlation Between Vascular Loops and Unilateral Auditory Symptoms? The Laryngoscope. 1998: 1739-1742. 1) Resident Medical Doctor of the 3rd year of the Otorhinolaryngology Service of Hospital de Clínicas of Universidade Federal do Paraná. 2) Otorhinolaringologist Medical Doctor . Responsible Doctor of the Ambulatory of Otoneurology of the Otorhinolaryngology Service of Hospital de Clínicas of Universidade Federal do Paraná. 3) Radiologist Medical Doctor. Doctor of the AID - Advanced Image Diagnosis - Curitiba - PR. 4) Doctor in Otorhinolaryngology. Full Professor of the Otorhinolaryngology Service of Hospital de Clínicas of Universidade Federal do Paraná. Article received in March 15th of 2011. Article approved in August 14th of 2011.